WARNING: This product can expose you to chemicals including Lead and Diisononyl phthalate (DINP), which are known to the State of California to cause cancer, and Lead, which is known to cause birth defects or other reproductive harm. For more information go to www.P65Warnings.ca.gov. 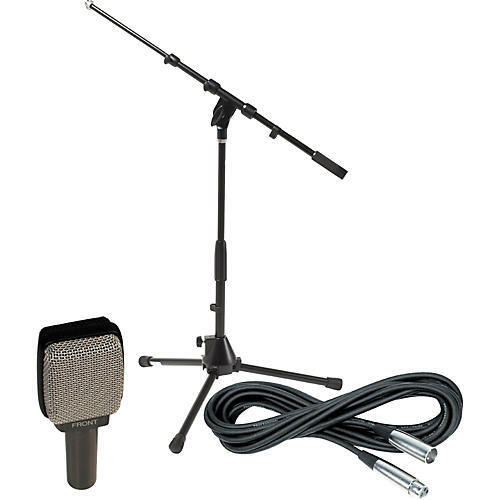 This package includes 1 Sennheiser e 609 dynamic guitar mic; 1 Gear One 20' mic cable; and 1 DR Pro DR259 tripod mic stand with fixed boom. The Sennheiser e 609 Silver Dynamic Guitar Mic makes getting killer electric guitar sounds in your project studio or onstage a cinch. The e 609 Silver is based on the legendary MD 409 mic, a longtime secret weapon of engineers for recording rock guitar with plenty of growl and punch. Able to withstand high SPLs without distorting, the e 609 Silver's flat-profile capsule facilitates extremely close miking of guitar cabinets and is also suitable for drum miking, particularly toms. The e 609 Silver's supercardioid design improves isolation in live sound reinforcement and recording applications while its increased output and wider frequency response improves performance. Its sound inlet basket, made of refined steel, is distinguished by a unique silver address side. For serious-minded musicians, Gear One's XLR cables have the strength and durability to withstand more than everyday use. Since your cable is your sound, this XLR mic cable's superior wiring allows your signal to be quiet, eliminating frustrating hums, buzzing, and crackles. The DR Pro DR259 keeps things simple with a basic low-profile tripod microphone stand with telescoping boom. The boom is 19" and extends to 31". It is height adjustable from 9" to 17". The tripod legs extend to 19" per side. Height adjustable to 9" to 17"
Height adj. : 35" - 61-7/8"